SureCrete Design Products introduces the new Xtreme Series Terrazzo. This eco-friendly product provides consumers with unlimited base color options, each embedded with colorful recycled glass aggregates that produce one of a kind decorative concrete countertops, back splashes, wall panels and other pre-cast elements. These cement based recycled glass surfaces are the most eco-friendly fabrication option available. SureCrete Design,a specialty concrete manufacturer and leader in the decorative concrete industry, has announced the release of a new full line of Terrazzo Concrete color design options to be used in conjunction with their Xtreme Series Terrazzo Mix. This high early strength cementitious casting product allows for up to a 150% load of recycled aggregates and is the strongest composite in the terrazzo industry. Each of the new Xtreme SeriesTerrazzo color designs utilizes both post-consumer and post-industrial materials, making it a very eco-friendly, zero VOC product that can earn up to five LEED points. The new color designs provide an array of base hues embedded with colorful recycled aggregates, making them a unique and stylish choice for a variety of applications. Typical areas of application include residential, commercial, or industrial concrete countertops, back splashes, wall panels or other custom designs. Xtreme Terrazzo’s versatility also allows for the fabrication of precast, cast-in place, or the unique “capping” of existing cabinetry with decorative highly polished exposed aggregate countertops. It may also be used to fashion extreme curving furniture or produce any manner of durable architectural panels. The team at SureCrete also trains fabricators to cast cement based terrazzo utilizing the reduction method, which can reduce raw material costs by 20-25%. 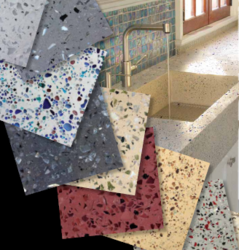 This innovative decorative concrete manufacturer's new Xtreme Series Terrazzo color designs will officially go live on July 2, 2012 at http://www.surecretedesign.com/products/systems/Terrazzo.php.